How to confirm, verify or know if your O’level Result (WAEC, NECO and NABTEB) have been succesfully uploaded on JAMB Portal. During my jamb registration, I used awaiting result to apply, now my result has been released, I want to upload the result into jamb portal. How can i know if my olevel result has been successfully uploaded? One major draw back about this jamb o’level result uploading of a thing, is that, it does not produce a print out after final submission or completion, but the best an alternative to the print out, is to have a screenshot of the information entered. For you to be sure that your O’level result was successfully uploaded and the information correctly entered, here are two things you need to know/do. 1. Visit any cbt centre, by yourself, and be there while your Olevel details are being entered / uploaded. 2. If someone is doing it for you by proxy, please ask the person to make a request for a screen shot, and get it printed out, so that you can review the hard copy of the information that was sent across to jamb portal. 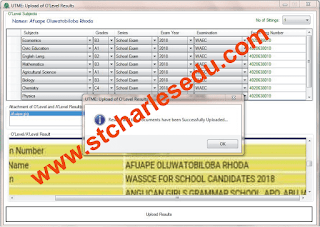 Here are screenshot of applicants O’level result that were correctly entered and uploaded. During my UTME Registration, I did not used awasiting result, I was asked to submit a copy of my O’level result. 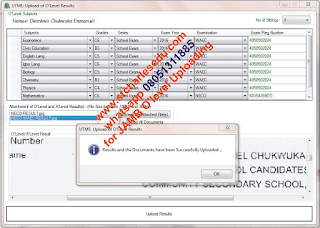 How do I know or re-confirm if my Olevel result was successfully uploaded. Jamb has not yet provided a means for applicants to check it by themselves if their Olevel result was correctly entered or uploaded in jamb portal. Applicants has to visit a cbt centre to reconfirm this. Upon visiting a cbt centre, once they type in your jamb profile code. A message will pop up, like this one showing below. The message above, only indicates that the scanned o’level document was successfully uploaded. It does not show or verify if your correct details were RIGHTLY entered. i. Subjects and their grade. ii. Examination number and year of exam. Please be alert as both details are necessary for admission. After years of experience in this business, I conciously mention this fact because of the setback it has brought on a lot of students. Some times I just decide to check if the O’level details were entered correctly by deleting the applicant’s previously uploaded document (as this enables me to see the candidates correct olevel “typed and scanned” details). And to my dismay, I some times find out that some subjects and their grade are not entered correctly. This most times end up as a huge setback to candidates. To be on the safe side, ask the cbt operator to show you the subject and the grade even if the system indicates that you have successfully uploaded your documents. Please do not forget to re-upload your scanned o’level document after seeing your grade. Thanks for finally talking about >"Jamb Portal: How to Confirm if Your O'level Result Have been Uploaded"
So this can’t be checked/confirmed by myself using browser?